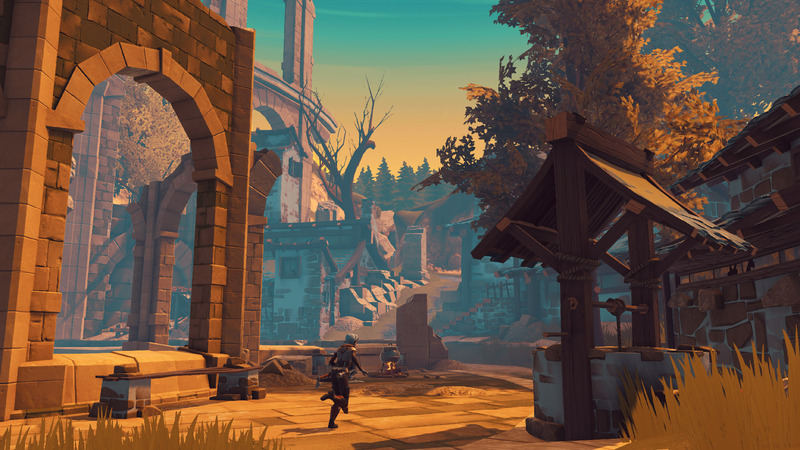 Decay of Logos is a hidden gem of an indie game that feels like a cross between Dark Souls and Legend of Zelda – and it looks the part. What’s more astonishing is that the team developing the game counts merely four designers. I had the unique opportunity to sit down with Ricardo Teixeira from Amplify Creations, one of the developers working on the game, and take turns tackling the various dangers of a Decay of Logos demo. For more on how such a small team was able to produce such an impressive game, check out the “behind the scenes” trailer below. As we first started the demo, Teixeira took control of our hero Ada and demonstrated the battle system of Decay of Logos. The game plays like many of the now common souls-like games but also gives off a strong Witcher vibe. Teixeira showed me how Ada could perform light attacks with her weapons. While these moves can stagger the enemies, they can shake it off quickly and hit back. Luckily, Ada is swift and can sidestep to dodge and avoid attacks. 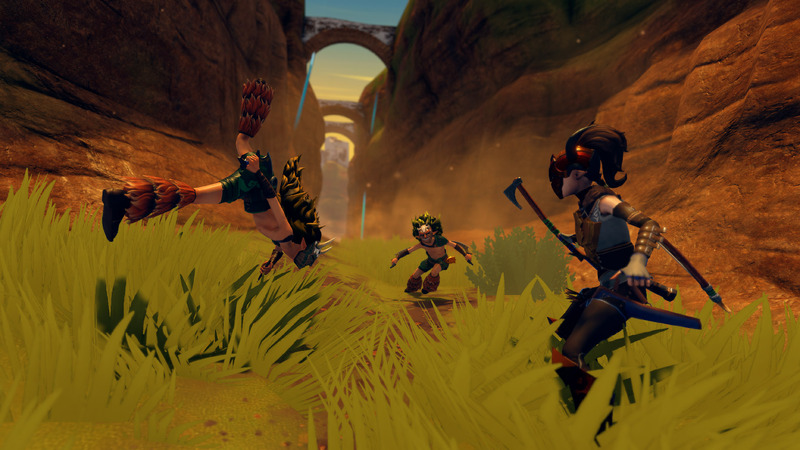 Teixeira explained how it’s best practice to dodge around enemies and flank them from behind since the larger enemies can deal us lots of damage. Apart from dodging, Ada can roll and perform parries to break through her enemies’ defenses. Ada also has another trick up her sleeve – spells. But casting these spells comes at a price: as there is no such thing as mana in Decay of Logos, whenever Ada casts a spell, it will cost her in health. In the demo, I saw a pushing spell, which can blow objects away with a gust of wind, much like The Witcher’s Aard sign. 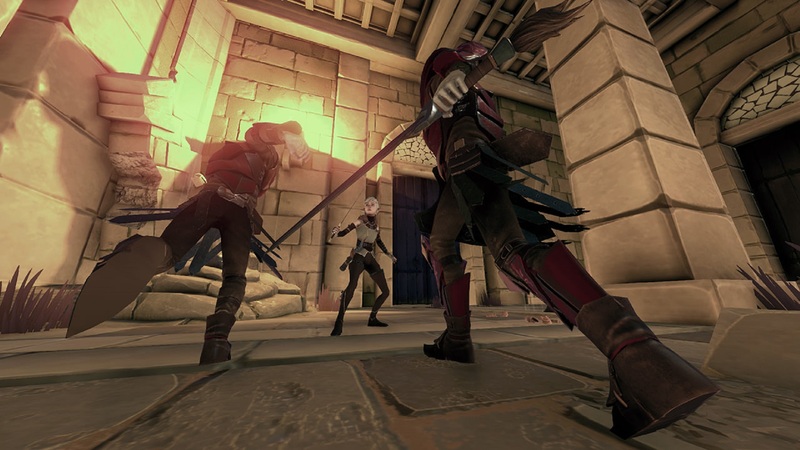 The story of Decay of Logos is a tale about vengeance. 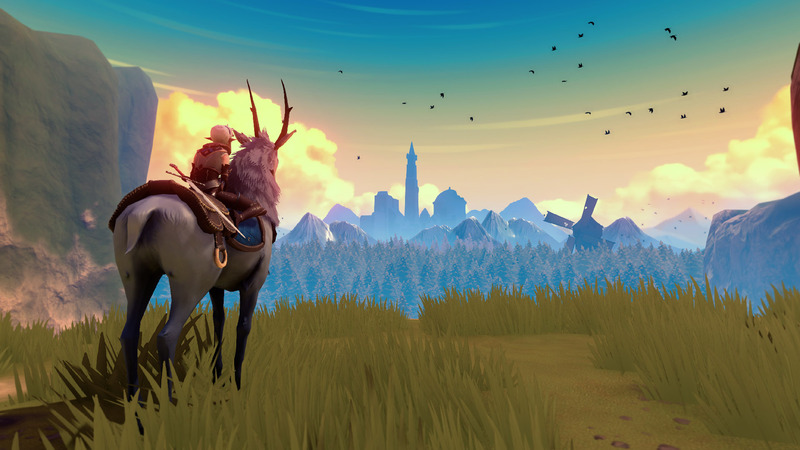 Fortunately, you won’t be alone in your quest for retribution; one of the main features of Decay of Logos is the mystical elk that accompanies Ada throughout her journey. The elk has many different uses, the first of which is to keep hold of your inventory. Unlike other heroes of the genre, Ada doesn’t have a bottomless bag. In fact, she doesn’t have a bag at all, and can only carry the items she has equipped on her. Having no bag, everything Ada keeps on her person will show on her character model, including potions, weapons, and other items. You’ll need to store everything else you might find on your journey in your saddlebags. The elk can also help you solve environmental puzzles. It can open doors, move objects, and can help you traverse certain areas. Getting help won’t be easy, as you’ll have to win the elk’s trust by slowly befriending it. During the demo, Teixeira suggested I pick a berry and feed it to the elk. Feeding it increased the elk’s happiness and trust enough to let me ride it. I took the elk for a ride, but it quickly threw me off as I went too close to enemies. The elk has a fear gauge that quickly fills when enemies are nearby. Teixeira explained how players would be able to keep the bar from filling up too quickly as they become better friends with the elk. One of the inspirations for Decay of Logos is the Dark Souls series, and the game indeed takes a lot from the series. Enemies will outnumber you and strike harder, and both Teixeira and I died quite a few times during our time with the Decay of Logos demo. But when Ada dies, she doesn’t exactly die. She wakes up from a nightmare in the last campsite she visited, much like the Dark Souls bonfires. But death is still very unforgiving. Upon dying, Ada’s stats decrease until she can get a good night’s rest. To make matters worse, monsters can interrupt your sleep, thus dragging you into another battle. It’s no secret that Decay of Logos draws from the style of Princess Mononoke and other Studio Ghibli films. Everything in the game’s world has a touch of dark magic, and I find it very appealing. The map we got to explore featured enemies that look like onions with teeth. Creepy, but cute. It also hosted enemies that look like humans that were turned into wood. Teixeira explains that these creatures were once human, and that it’s very tragic for our character Ada to have to kill them. A later tower dungeon, which we got to explore, hosted yet another example of the dark magic of Decay of Logos at work. As Ada searches for the king’s sons to exact her revenge, she comes across one of them who is possessed by a puppeteer sorcerer of sorts. In the boss sequence of that particular dungeon, players will face the possessed prince, who moves like a puppet at the hands of our sorcerer. The Decay of Logos demo was pretty intense, so we never managed to get to that part. The animations themselves look amazing, thanks to the meticulous work of the small team at Amplify Creations. If you’ve watched earlier trailers of the game, you probably saw how impressive the possessed prince animation is. Another excellent example of the hard work put into the game is the fact that Decay of Logos will feature no loading screens at all. We will be able to walk from one edge of the map to the other without having to load once. It also has an incredible draw distance, and we were able to see the tower dungeon from far away. If you feel like contributing to the art of Decay of Logos, there is an ongoing shield design contest in the game’s blog right now. If you have the skills for it, your shield design might be included in the full game. I had a lot of fun with Decay of Logos. 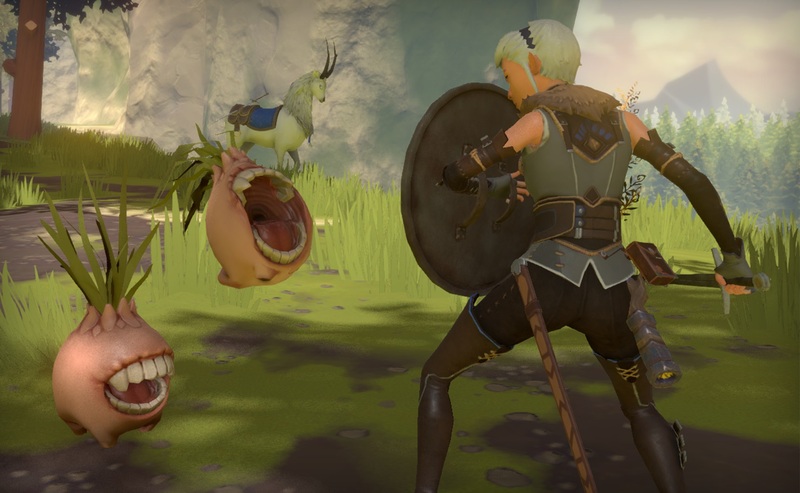 I have high hopes for the game – the animations are fluent, the world looks vast, and the combat is fun. It’s all too amazing considering how it was all done by a team of only four developers. Decay of Logos will release on PC, PlayStation 4, Xbox One and Switch sometime next year.